At every radiation treatment this white, mesh mask was put on my face and secured to the table. It kept me in the proper position for the radiation to accurately hit the cancer in my shoulder. Radiation treatment was upsetting to me; sometimes I cried under the mask. 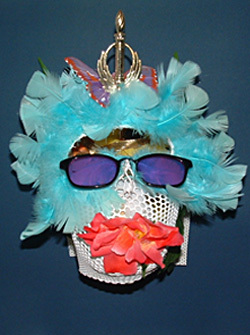 Now, wildly decorating the mask and giving it to this sculpture has transformed the mask from a restraint into art. I can let the mask go (and all that it used to represent) and feel confident that I'll never need it again.